(Verso) center, in pencil, "Garnett"
(Verso) across upper edge, wet stamp in black ink, "TOP [space] TOP [space] TO [space] OP [space] OP"; center, wet stamp in black ink, "Copyright 1966 / William A. Garnett / PHOTOGRAPHER / 1286 Congress Valley Road, Napa CA 94558" (date in pencil) and full copyright notice. (Verso) upper center, in pencil, "Cibachrome print / sprayed with McDonald's Pro-Tecta-Cote, clear"; center, in pencil, "Sand Bars and Sail Boat Cape Cod, Mass"
Inspired by a cross-country flight in 1945, Garnett learned to fly his own airplane and devoted himself to making aerial pictures of the landscape. His work reveals a beauty and order in the natural environment that cannot be seen from an earthbound perspective. 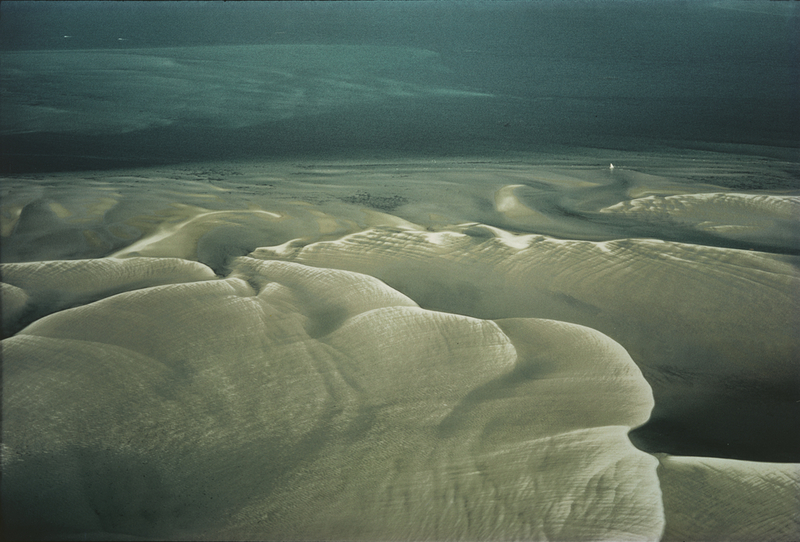 Here he captured a wide expanse of sandbars along Cape Cod, including a white sailboat (at upper right) to ground the nearly abstract image with scale and perspective.